Reuse Christmas gift bows to make a unique Christmas tree that can be displayed on the wall in place of a wreath. I don’t know about your home, but the floor of my living room is often littered with Christmas gift bows on Christmas morning. People tear open their wrapped gifts, and the wrapping paper and gift bows end up on the floor. I ended up with a giant bag of colorful bows one year, of all sizes and colors, after rescuing them from torn wrapping paper. Here’s one way to reuse those bows – make yourself a Christmas tree display guaranteed to liven up a shadowy corner or make people smile when they come to your door. Draw a long triangle on top of a small square against the fold of a sheet of newspaper. Begin by drawing half a Christmas tree pattern on a large, folded, piece of newspaper. Set the fold on the left hand side and draw a simple triangle on top of a square similar to the one in the diagram shown. This does not have to be exact so experiment with the lines, if you like, to get a Christmas tree shape that you like. Cut the pattern out of the newspaper. Open up your newspaper pattern and place it on top of the cardboard or bristol board. Tape it down temporarily with a few pieces of sticky tape. This is just to keep the pattern still while you trace around it in pencil. 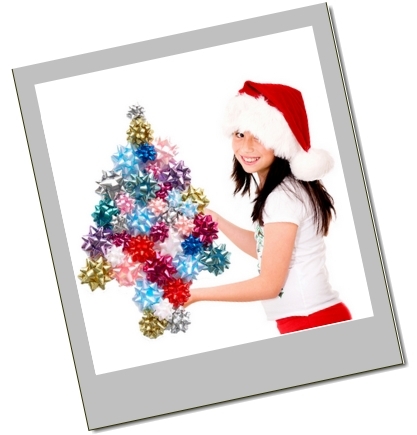 Cut out the Christmas tree, using scissors for bristol board, or a craft knife for cardboard. On the back side of the tree, firmly tape down a short piece of string or another form of picture hanger, in the center of the tree near the top. Set the Christmas tree base on a table and make a preliminary arrangement of bows on top of it. Once you have an arrangement that looks good to you, begin fastening the bows into place using a small piece of double-sided tape, or a small dab of hot glue, for each one. Secure the bows around the outside of the tree first to establish the outside lines. Then begin filling in the center with whatever arrangement of sizes and colors works for you. When the tree is totally full of bows it is ready to hang on the wall, a smile maker waiting to work.